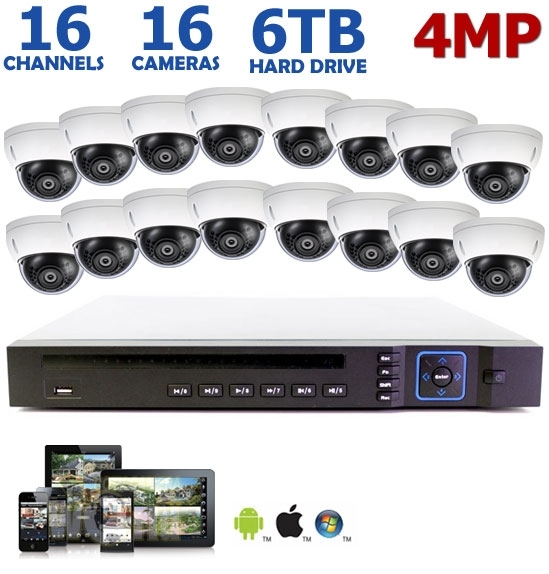 This is a complete 16 channel IP security camera system that records at one of the best possible resolutions capable in the security cameras industry. With double the resolution of 1080p HD, these 4MP cameras will provide clear and crisp video footage that will impress anyone. With 4 MP security cameras, you can expect to see facial detail up to 50ft away in daylight and 35ft at night. This dome camera system includes sixteen 4MP vandal resistant IP dome cameras and one 16 Channel PoE NVR with 16 built-in PoE ports. The dome cameras feature a 2.8mm wide angle lens that provides a 106 degree angle of view, and 100ft of night vision to see in complete darkness. The progressive scan 4MP image sensor inside these cameras also provides real WDR, which allows for reduction of glare from the sun or other light sources. 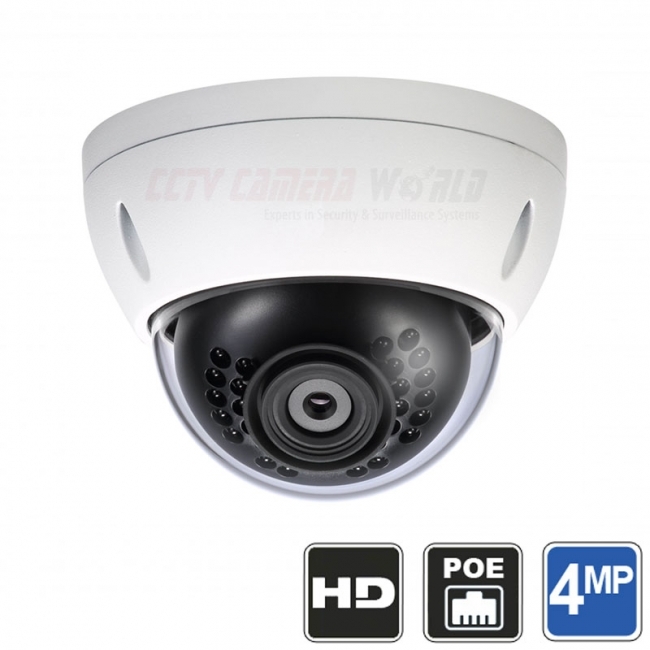 The cameras are weather proof IP67 rated and can be used indoors or outdoors without worry. The cameras are small and discrete, making them ideal for projects that require aesthetically pleasing cameras that can be mounted on a wall or ceiling. Like all of our IP security camera systems, this 16 camera IP system is truly plug and play. The 16 Channel PoE NVR has 16 built-in PoE ports on the back. 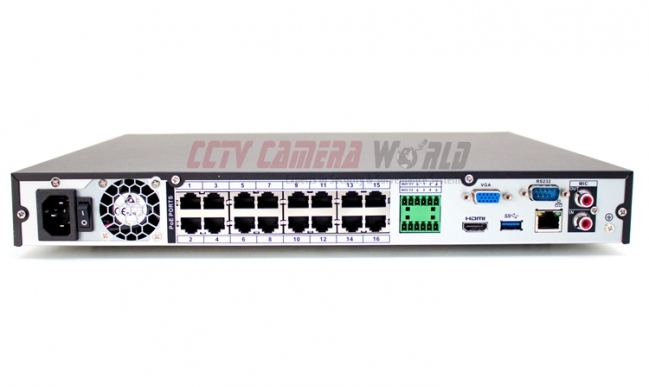 With Power over Ethernet (PoE) ports there is no need to run additional lines to power the cameras. One CAT5e cable per camera will both power and transmit data up to 328 feet without a repeater. Simply mount your cameras and wire them directly to each of the PoE ports on the NVR, and the NVR and cameras will automatically negotiate configuration and start recording at 4MP. There is no need for networking skills to configure the included cameras for use with the NVR. The NVR recorder comes with 6TB of storage that provides 4 days of video recording 24/7 with auto-overwrite. Our high capacity hard drives will ensure that you won't lose precious footage to re-write. You can record 24/7 for 4 days at full camera resolution before the recorder begins to overwrite old footage. 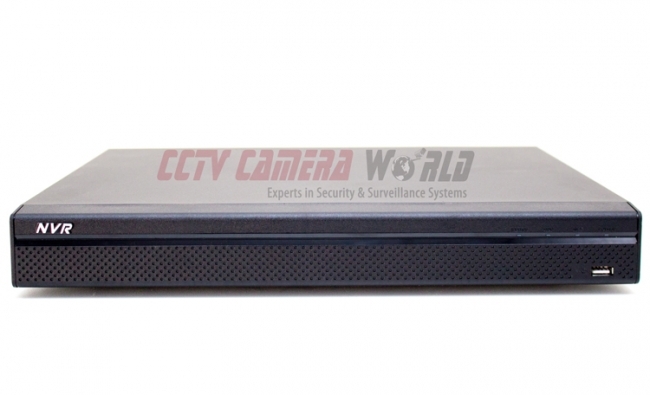 This security camera system includes a 6TB Hard Drive that is pre-installed in the network video recorder. If you are looking for more video retention time, we suggest upgrading the hard drive, and using the motion detection based recording method. What is electricity consumption required per day for this 16 channel + 16 2MP camera IP CCTV system? The system will use about 160W max when the infrared on the camera is on.